Anyone looking for me over the two-and-a-half weeks from Friday won't be needing to look too far, assuming the looking isn't taking place before ten in the morning. March, in the Little House of Concrete, now means Moogis, and for thirteen of the seventeen days from March 11 to 27 that means I'll be settling down in front of the TV in the living room, laptop plugged into the HDMI, notebook and pen at the ready, plate of assorted nibbles for sustenance ready for another three-and-a-bit hours of Allman Brothers magic. Your average, common or garden music fan will, on reading that comment, undoubtedly be scratching his or her head and mirroring 'Er Indoors' opinion that you don't really need to see all thirteen of those shows live. Various friends and acquaintances, told that if they're interested in catching all or part of any of the shows should feel free to drop by because they will, all other things (i.e. the power supply) being equal, be being watched may have had some of the same reservations. You know the sort of thought that might pass through the head. I know he said that, but did he really mean it? Well, not to put too fine a point on it, I intend, all things being equal, to catch every minute of thirteen live webcasts because the constraints that might prevent the average listener from seeing multiple shows by a favourite artist just don't apply here. There are plenty of acts who'll work through the same setlist night after night, and I'm not knocking that. Three hours of Leonard Cohen in November last year didn't vary markedly from the NPR podcast I downloaded nearly three years ago or the Live in London DVD I bought, but remains one of my favourite live concert experiences. And if Leonard is back on these shores I'm going. Even if it is the same show. Most played song: Statesboro Blues (play count 9). So, averaging things out, based on 2009, in any given show you'd be likely to get sixteen songs in two sets, three of them probably played only once through the run and a number of different guests on stage with the Brothers (average four per show on the above figures, but they tend to have what you might term a number of repeat offenders (the five-piece horn section from Southside Johnny & The Asbury Jukes, for example). Notable guests from 2009 (chronological order): Taj Mahal, Levon Helm (The Band), Johnny Winter, David Hidalgo and Cesar Rosas (Los Lobos), Buddy Guy, Boz Scaggs, Bruce Willis (yes, that Bruce Willis, he plays harmonica), jazzers Randy Brecker, Lenny White and Stanley Clarke, Robert Randolph, John Hammond, Susan Tedeschi, Sheryl Crow, Eric Clapton, Southside Johnny, Bruce Hornsby, jazzers Bernard Purdie and Jimmy Smith, Sonny Landreth, Billy Gibbons (ZZ Top), Bob Weir and Phil Lesh (from the Grateful Dead). Guests weren't quite as thicken the ground last year, but that's probably down to the change of venue. 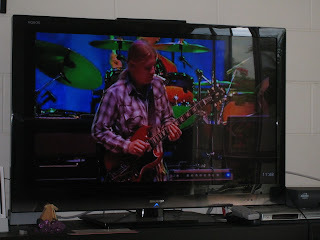 There are a few milestones in this year's run, including their 200th show at the Beacon Theatre, and the 40th anniversary of the gigs that produced Live at the Fillmore East, which I'll be catching this Sunday morning. All this is possible through a little internet operation called Moogis, brainchild of drummer Butch Trucks, which promises to deliver all thirteen shows streamed into your living room along with the archived performances from 2009 and 2010 for a pretty reasonable $US 200. What a wonderful thing this parity is! That subscription expires at the end of February next year, by the way. Moogis-associated costs tend towards the controversial in ABB Fan-land, but given the fact that the $US 250I paid for Moogis coverage of the Beacon run and the weekend Wanee Festival in April is about what it cost for two tickets to see Derek Trucks and Susan Tedeschi in Sydney (airfares and accommodation on top of that) it strikes me as a reasonable deal. Yea, I know the concert experience is different, but so is the chance to watch something live from the other side of the world with a few friends and (hopefully) something interesting to eat and drink). I haven't looked into the food side of things too closely yet, but I'm thinking along the lines of tapas with something fairly light and summery (the Rockford Alicante Bouchet, Lenton Brae No Way Rose or one of the Sauvignon Blancs or SSBs from Margaret River). In other words, this is something I'm definitely looking forward to. Some musings on the musical side of things to follow on the morrow.